On Tuesday, tenor Lawrence Brownlee had a busy day of rehearsals for Il barbiere di Siviglia at the Met. During a costume fitting, he was asked by the company’s artistic director how he felt about the role of Tonio in La fille du régiment—a role he hadn’t sung in over two years. Still, Brownlee said he felt secure and could sing it on short notice. That was just the answer the Met was hoping for. Brownlee was asked to go on that evening for an ailing Juan Diego Flórez—and had only about 5 hours to prepare: reviewing the music, learning staging and choreography, having costume fittings, doing a quick walk-through on stage, and memorizing the Met’s extensive and specially-written French dialogue. To add even more complexity, Diana Damrau, the scheduled Maria, had fallen ill, and her cover, Leah Partridge (our alternate cast Lucia next season) was singing that night as well. 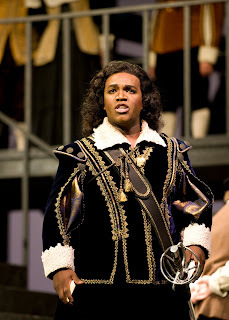 You can catch Brownlee back in Seattle in 2011 as Almaviva in Il barbiere di Siviglia. And congratulations to both him and Leah Partridge on a job well done!